The urge to play with consciousness is hard-wired into the human psyche. Little kids roll down hills to make themselves dizzy or press their palms against their eyes to create visuals. They spin in circles until the world tilts into an altered state of reality. They naturally transmogrify their experience of themselves and of the world before they form ideas about the legality or morality of doing so. Adults drink alcohol, take psychoactive drugs, dance themselves into trance states, and seek all manner of altered experiences from sweat lodges to meditation retreats. Even the most straight-edge teetotaler will try downhill skiing or a roller coaster ride for the adrenaline rush. We have a smorgasbord of substances, technologies, and practices that can aid in our pursuit to play with our minds. And yet many ignore one of the best playgrounds we have: dreams. Dreaming is the original nonordinary mind state. It's also the one most universally experienced. Most of us visit bizarre, visionary worlds during the one-third of our lives that we spend asleep. There are many reasons to explore one's dream life. Perhaps you're looking for inspiration; artists and thinkers from Dali to Edison to Kekulé--who first accurately described the structure of the benzene ring--have harnessed the power of liminal dreaming for creativity and problem solving. Lucid dreaming has been used therapeutically for PTSD sufferers to defeat nightmares or to allow people to have a conversation with someone who died before important things were said. Dreams have been used for foretelling the future and for astral travel. The list of purposes for pursuing dream work is long, but really, one needs no reason beyond a desire to play with one's consciousness. Dreaming is an easy, free, safe, legal, and effective way to experiment with consciousness. As a member of Erowid Center's Board of Directors and a woman who has spent much of her 50 years on this planet considering the potential of psychoactive agents of all sorts, my interest in the exploration of mind states runs deep. In my youth, I gravitated toward obvious choices: herbs, chemicals, practices, and technologies that powerfully affected my experience of being. As I've become increasingly familiar with my own mind, as well as options for tweaking it, I've grown fonder of subtler allies. I used to favor things that clobbered me over the head with raw psychedelic power. These days, I like to put in more of the effort, to meet my medicines halfway. The effect is no less mind-blowing. Dreaming is an easy, free, safe, legal, and effective way to experiment with consciousness. I teach and write about dream work as a means of exploring mind. Someone recently called me a "dream tripper". It's a fine phrase. I have many ways to work with dreams, for similar reasons and to similar effect as other people do with their psychotropic of choice. You're likely familiar with liminal dreams, though you might not realize it. REM dreams tend to have a narrative structure where dreamers have subjectivity of some sort and a world around them, like waking life. Liminal dreams, which occur most often as one is falling asleep or waking up, don't have the same structure. They tend to be more free-associative. My current fave dream tripping involves hypnagogia, the transitional state moving from consciousness into sleep. Most dream states are marked by consistent brain wave cycles, oscillations in frequency of the electrical impulses detectable with an electroencephalograph (EEG). In general, we sleep in cycles of 90-100 minutes, so if one manages to get 7½ hours of sleep, that's about 5 cycles in a night. Each cycle is marked by return to a waking or near-waking state, however brief. Most of us don't remember these awakenings. Brain waves, as measured by an EEG, look like a noisy, choppy wave pattern. They are measured in waves per second called hertz (Hz); higher frequency waves are faster and lower frequency waves are slower. An alert mind generates a higher proportion of fast waves, called beta waves (13-30 Hz). 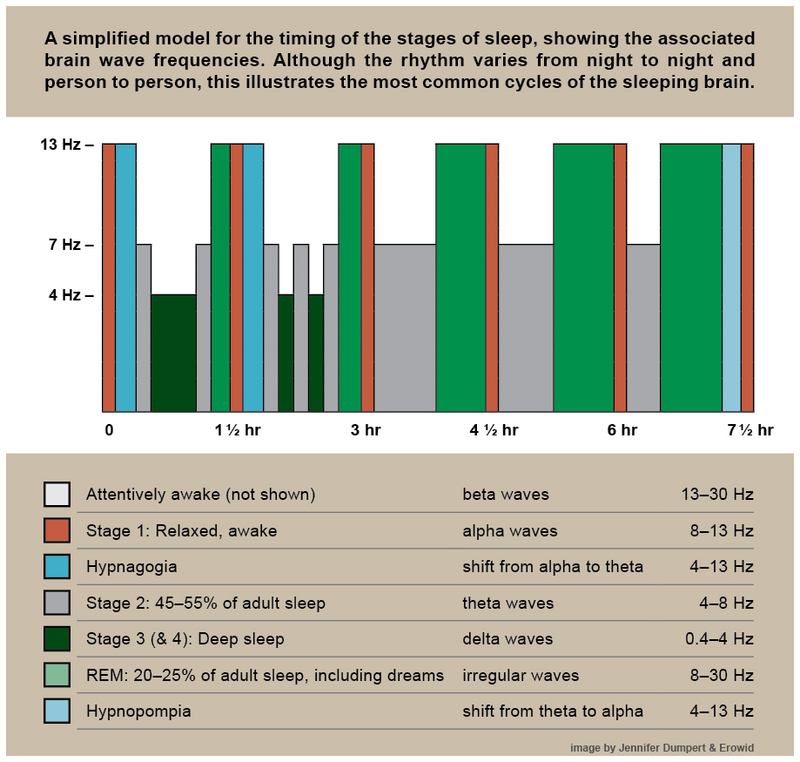 In deepest sleep the brain produces more slow waves, called delta waves (0.4-4 Hz). Hypnagogia, unlike the other sleep states, produces chaotic, inconsistent wave patterns. The brain shudders up through a series of micro-awakenings and then sinks down toward sleep, ricocheting between alpha (8-13 Hz) and theta (4-7 Hz) frequencies. The body twitches just like the brain waves do. Those little physical jolts, called myoclonic or hypnagogic jerks--sometimes accompanied by the feeling of falling--let the sleeper know that they're in liminal dream territory. Hypnagogia's twin state, which happens when transitioning from asleep to awake, is called hypnopompia. This dream state meanders back and forth across thought and dream, remixing memory and imagination in a hazy, sometimes pleasant drift. Hypnagogia offers a kaleidoscopic swirl of images, thoughts, memories, ideas, and visions. I've spent much of my life yearning for a hangover-free, intense 15-minute trip. Now, through liminal dreaming, I've found it. My hands create a visible but transparent glowing force field that takes shape around a magician's valise. It becomes fabric in my hand, blows in the wind long and rippling, a river flowing through rocks toward the ocean, silvery and glittering in the sun. Everything felt incredibly vivid and looked astoundingly beautiful. A sense of wonder accompanied the dream, along with a feeling like standing on a cliff with the wind in my hair. Although "I" was in the beginning of the dream, the rest of it consisted of just images and sensations, like an interior monologue in technicolor. To try this method of dream tripping, wait until you're feeling a little sleepy. Get comfortable, maybe lie on the couch or sit back in a comfy chair. Then close your eyes and relax. Let your mind drift, but don't fall asleep. You're waiting for something, an image, an idea, maybe a distant sound. It may start as only a glimmer. Once it's there, exhale into it. As you breathe out, release any tension in your body. Focus your attention on whatever emerges, like watching something far away from you move toward you, taking on shape as it gets close enough to see in detail. Keep relaxing your body. Get as close to falling asleep as you can, but keep yourself awake by maintaining awareness on the liminal dream that's forming in your mind. It takes a little practice to hit the sweet spot between being so drowsy that you fall asleep and so focused that you can't drift off at all. But with practice, you can learn to linger in this altered mind state. As a side note, while THC in its various forms inhibits REM dreams, it can enhance liminal dreaming. In fact, hypnagogic and hypnopompic dreams play well with many psychoactive substances. Lucid dreaming used to be a pretty esoteric concept but now it's the subject of books, phone apps, and articles in mainstream publications like Newsweek and Time. At its best, it's like being in a total virtual reality world, built from your own thoughts, perceptions, and memories. Sounds good, right? The problem is that, unlike liminal dreaming, attaining lucidity in a dream is difficult. Some people have spontaneous lucid dreams, but few are able to be truly (or even partially) lucid in their dreams with much regularity. If you want to get into it, you can find plenty of field guides, though some people report practicing techniques for years with disappointing results. I have a trick, a shortcut for improving dream recall and increasing the frequency of lucid dreaming. If you're interested in dream tripping and looking for a fast track, consider oneirogens. The word oneirogen is composed from the Greek roots oneiro--dream--and gen--to create. A variety of herbs, roots, flowers, scents, and practices are used to increase, alter, or suppress dreams. I have been keeping dream journals for the last 36 years. One is a Twitter feed where, since 2009, I have posted a dream a day as @oneirofer. In 2010, I founded a group called the Oneironauticum. This group has explored a wide range of oneirogens. On a predetermined night, people around the world try the same oneirogen in an international slumber party dedicated to consciousness exploration through dreams. Some participants, including myself, submit experience reports of their dreams to my site urbandreamscape.com, where one can read dreams associated with various dream-affecting practices. I think the most effective oneirogen currently known for facilitating lucid dreaming is galantamine. An alkaloid derived from bulbs and flowers of various plants--the kind I take comes from red spider lily--galantamine is used in the treatment of Alzheimer's and other memory impairments. As a cholinesterase inhibitor, galantamine blocks the action of acetylcholinesterase, which breaks down the neurotransmitter acetylcholine. In so doing, it temporarily increases acetylcholine levels in the brain. Cholinergic systems are active in dream creation and recall and may also affect the likelihood of self-awareness in dreams. Stephen LaBerge, one of the leading voices in the study of lucid dreaming, applied for a patent in 2003 on the method of using substances like galantamine to promote lucid dreams. In 2008 I attended one of his workshops where he gave me galantamine. It worked for me, it's worked for Oneironauticum participants, and according to LaBerge it works for others, too. Because galantamine is short acting, LaBerge recommends taking it five hours after first going to sleep, when the longer periods of REM sleep begin (see chart). He suggests 6-8 mg as a starting dose, compared to the 12 mg or more that Alzheimer's patients take daily. Pick a night when you can afford to have your sleep cycle interrupted. Leave the capsules by your bed and set your alarm before you go to sleep. Wake up briefly to take your galantamine and go right back to sleep. I've followed this protocol with great success. Even if you don't achieve lucidity, you're likely to have amazing dreams. In one galantamine-inspired lucid dream, I wanted to get out of the house but had no corporality. Without solid body parts, I couldn't open doors or windows. After trying and failing several times, it occurred to me that I could just pass right through one of the panes of glass. I felt the window slide through me on a cellular level, squeaky, disruptive, incredibly visceral, and indescribably bizarre. One of the most celebrated oneirogens is a flowering plant traditionally used by the Chontal people indigenous to Oaxaca, Mexico, for the purposes of oneiromancy (divination based on dreams). The Chontal believe that dreams happen in realms beyond those we consciously perceive and that the contents of dreams can convey meaningful messages or prophecies. They further maintain that calea clarifies the senses so the dreamer can more clearly perceive insights and can bring them back into waking memory. Some people also use calea to induce lucid dreams. Smoked or steeped into an astoundingly bitter tea, calea can produce intense sensory experiences. Dream reports include memorable tastes, vivid colors, and beautiful and unidentifiable scents. In a calea dream, I once read a long text, a notoriously difficult thing to do in dreams. It even had pink highlighting and notes in red ink. "I was at a party with lots of people dancing and playing music, fun pop music except there were also all these African drums. There was a beautiful girl with a long blue dress on. The dress was the most amazing color, a glowing, electric blue. [...] I decided to bring the girl a glass of punch and so I went to the punchbowl but there wasn't any left, but there was a bottle of something. I tried it to see if it was good. It was, but it tasted like Indian spices, which even in the dream seemed weird to me." In Korean tradition, mugwort hot baths or steams (mugwort soaked in water then poured over hot rocks) taken late at night are used to induce vivid dreams. Mugwort actually refers to several species of plants in the genus Artemisia. The oil contains thujone, the active ingredient in traditional absinthe. Although it can be made into a tea, the Oneironauticum group works with it as an olfactory oneirogen. I find that the scent of mugwort produces saga-length, minutely detailed dreams. It also improves dream recall. People interested in astral travel claim that mugwort can enhance the sensation of leaving one's body. Our dream group makes pillows or sachets with this oneirogen. We add lavender to aid sleep and dried rose petals to counteract bad dreams. (These herbs are available at many health food stores.) Put the dried plant materials into a small, loose-weave bag (or even a sock) and place it near your pillow while you sleep. For extra oomph, sprinkle some mugwort essential oil onto the dried herbs. "In the first dream, I was outside on campus. A dog came running over, and then suddenly a bunch of dogs came. Then I realized that I was dreaming. I've never had that happen before." "The second was tied to the fact that we'd all commented earlier on how beautiful tonight's night sky was. The dream was that the universe was a huge blackboard and I had white chalk and felt pressured to hurry and begin creating the universe once again, beginning with the stars [...]"
"In the third, a gold and white fish came swimming over to me and made eye contact and then flipped over to expose his wiry, black pubic hair. He wanted me to focus on it." This flowering herb grows in the Eastern Cape of South Africa. The Xhosa people native to that land use its root for their form of oneiromancy. They believe that Silene capensis facilitates communication with their ancestors, who provide guidance or prophecy. "A magic woman appeared in my dream blowing smoke over me and my sister. It was a ritual of some sort, and the woman was Native American [...]. As the woman blew smoke onto me, I went up into dolphin asana, the yoga pose where you're on your feet and your elbows. [...] I went up into headstand, then into one-armed headstand, then I levitated off of the ground." In my opinion, dreaming can rival the aesthetic perceptual immediacy of psychedelic experiences. With practice, many people can learn to interact with dreams in ways that increase access to creative, visionary states. If you're interested in consciousness exploration, cultivate your dream life. Sweet dreams! Chart by Jennifer Dumpert & Erowid. v1.0 - Aug 2016 - published in Erowid Extracts. v1.1 - May 2017 - Erowid - Published on Erowid.org.